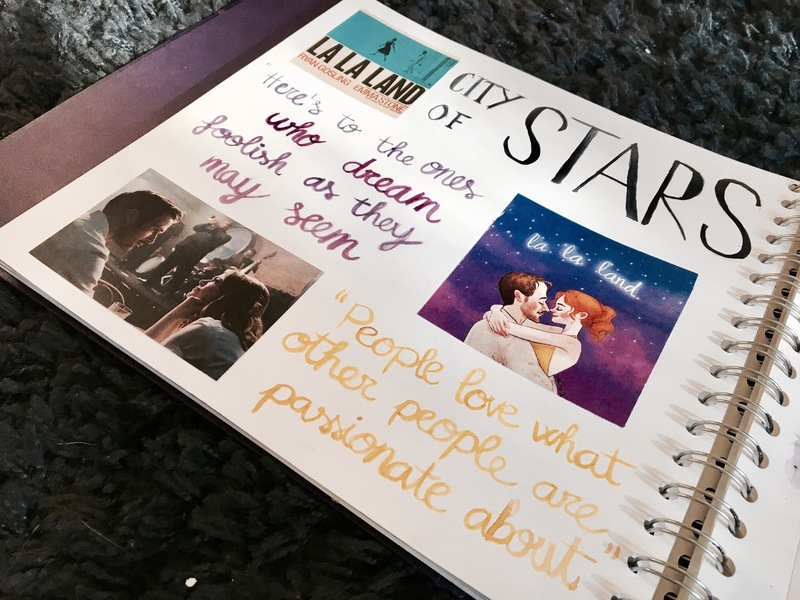 I went to see La La Land on Friday and since then I’ve been OBSESSED with it. That’s why I thought it’d be convenient to write a review about it. 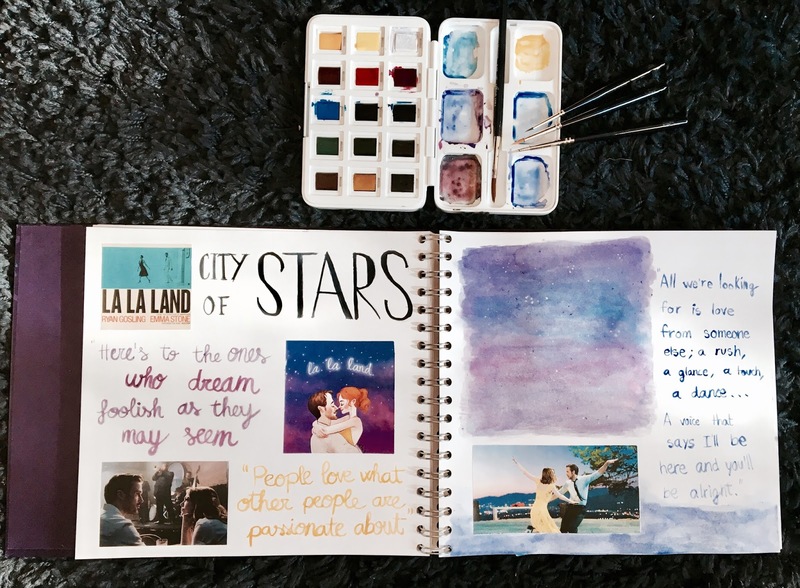 I was also inspired by Carmen’s bullet journalling posts (she wrote a few in December, each about a different topic) so go check out her blog, it’s great and she’s so nice. I didn’t know much about La La Land before watching it, only a bit of the plot and which actors were in it. Honestly, I’m a sucker for musicals so I was already sold on that one. Then I saw that pretty much everyone on twitter said it was great and also, I watched the Golden Globes so I knew it won 7 awards. That meant it HAD to be good, right? For those of you who don’t know what the movie is about, I’m just gonna tell you a bit of the plot without giving away too much. I honestly feel like everyone should have the experience of going into it without knowing what’s going to happen. Mia (Emma Stone) is an aspiring actress and Seb (Ryan Gosling) is a jazz pianist who wants to open its own jazz club. Both of them have big dreams and the movie is basically about how they achieve them. But life gets in the way of that and they just have to figure things out along the way. There’s also love involved but, in my opinion, that’s the main focus of the film. 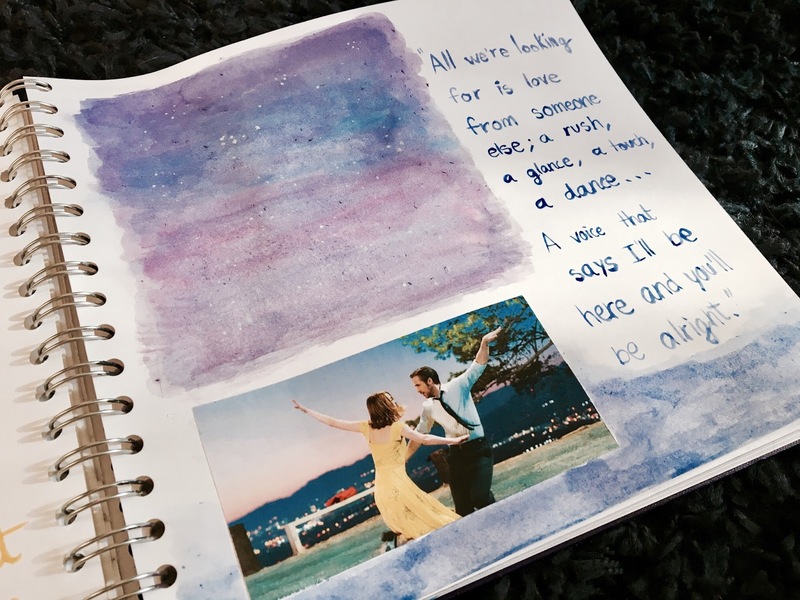 Mix all of that with beautiful music written by Pasek and Paul and beautiful cinematography directed wonderfully by Damien Chazelle and you have La La Land. The drawing on the right is by Saliha (tumblr and instagram) check out her stuff, she makes beautiful art. I completely LOVED IT. Not only because the story is great but because of the way it’s made. I think Damien Chazelle (he also directed Whiplash, another great movie) did a brilliant work, everything is so well made. The visuals are stunning, you can see that every shot is well thought of. I believe that the color palette of the movie changes as the story progresses which makes it even more beautiful and very aesthetically pleasing. You could feel that some of the long shots are boring but if you think about it, they really aren’t, at least not to me. Honestly, I just can’t properly put into words how visually beautiful this movie is. I already said the music was perfect but I wanna talk about it a bit more, just because. The thing is there is not a song every five minutes, like other musicals, and the songs aren’t sung by people with huge voices. However, Emma Stone and Ryan Gosling did a great job and I loved the rawness of their voices. Every song fits into the film so perfectly. Seriously, just go listen to the soundtrack, such a masterpiece. The Planetarium bit is just so gorgeous, both the song and the imagery. Another thing I love about La La Land is that, unlike other movies, the girl doesn’t drop her dreams to support her love interest. The movie is mainly about her and her dreams and how she works hard to get where she wants to be. I literally was like HELL YES, Mia, you go girl. There’s also been some controversy about the ending of the film. Now, I won’t go into detail about it because spoilers BUT for me, it was the right ending. Not what I would’ve hoped for at first but perfect and understandable anyway. In my opinion, everything about this movie is just magical. The story, the music, the cast, the way it’s made... I even cried at some point because of the story and because of the emotion in one of the songs (Audition). Right after watching the movie I felt so inspired and creative, that must mean something. really think this is what the movie was all about, inspiring people to pursue what they are passionate about, what makes them happy. Also, I don’t think I’ve ever seen a classic Old Hollywood musical but because of this movie, I actually want to. I think the movie is specially made for creatives: artists, writers, and actors of all sorts but overall, for dreamers. Still, everyone can enjoy it because, again, it’s brilliant. Seriously, watch it, don’t miss out on this just because ‘it’s a musical’ or because ‘it’s just a love story’. It’s not, believe me. I’ll leave you with a quote from Emma Stone’s Golden Globe speech. "This is a film for dreamers and I think that hope and creativity are two of the most important things in the world and that’s what this movie is about… so to any creative person who has had a door slammed in their face, either metaphorically or physically…or actors who had their auditions cut off or had a callback that didn’t come…or anybody, anywhere really..that feels like giving up, someone who finds it in themselves to get up and keep moving forward, I share this with you." BONUS: Dodie Clark did a video talking about her love for this movie, but only watch it after you've seen the movie because it has spoilers. I think I'm just obsessed as she is lol ALSO she and Jon Cozart did a cover of one of the songs so go check that out if you want too! Have you seen this movie? Are you as obsessed as I am? Ah I hope you can watch it soon!! YES I think you'll love it :) Aw thank you so much!